As Chubby Checker's song, "The Twist" becomes a favorite among teens, technology continues to progress, as seen by the use of aluminum cylinder heads and raditors on select Corvettes. This year sees the first "laser" and the TV show, "Route 66" makes headlines. Briggs Cunningham Le Mans Corvette - No. 1 Found: Press release from Carlisle Events describing the discovery of the 1960 No. 1 Briggs Cunningham Le Mans Corvette. Big Brake Fuelie Prototype: Mecum auction listing for a 1960 Corvette Big Brake Fuelie Prototype - 1 of 2. Gallery: An online gallery of high quality 1960 Corvette pictures. Identification: Learn how to identify a 1960 Corvette. Identification: Light Bulbs - 1956 - 1962: A quick summary of Corvette light bulb identifiation numbers from 1956 to 1962. Identification: Radios - 1956 - 1962: A quick summary of Corvette radio identifiation numbers from 1956 to 1962. Identification / Serial Numbers: A quick summary of 1953 - 1962 Corvette serial and production numbers. Knowledgebase: 1953-1962 Knowledgebase covers related service bulletins and technical information. LOF Glass Date Codes: LOF Glass Date Codes for the 1953 - 1982 Corvettes. Powertrains: A quick summary of Corvette powertrains from 1953 to 1962. Production and Performance Numbers: Performance and production information for the 1960 Corvette. Production: 1953 - 1962: This graph depicts Corvette production of the first generation from 1953 to 1962. Sales Brochure: Images of each page in the 1960 Corvette Sales brochure. Sateen Silver 1960 Corvette: This is an excellent example of a 1960 Corvette in Sateen Silver with white coves listed for auction by RM Auctions. Specifications: Specifications for the 1960 Corvette. Specifications: Radiators: A quick summary of Corvette radiator specifications from 1953 to 1962. 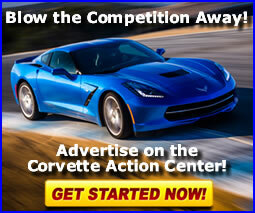 Videos - C1 Corvettes: C1 Corvette videos provided by our sister site - VetteTube.com.